The Custards: 'Tis the season to be thrifty...tra la la la la - la la la la la! 'Tis the season to be thrifty...tra la la la la - la la la la la! For today's lesson let us focus on saving money. 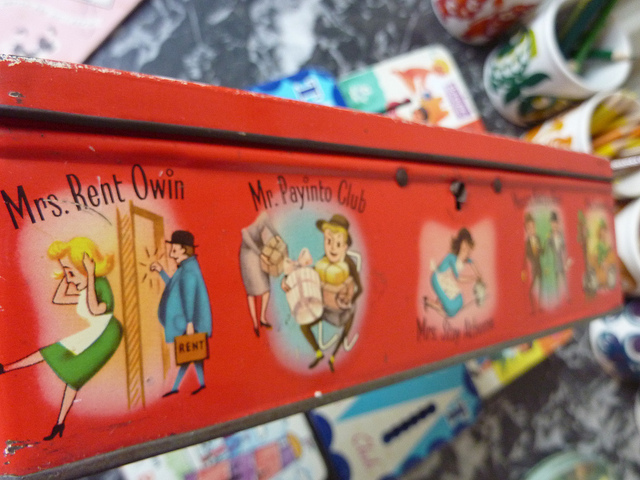 Our mum kept savings in a plain saving tin - different sections for the coal man, milk and bread man and so on. I was part of that saving because I would count the money to check there was enough. I had a particular interest in the coal money - another job being counting the sacks of coal as they went into the coal shed (I was very scared of that coal shed - no light but lots of cobwebs - also fascinated by the coal man and his coaley face! ), just to check we were not being short changed! 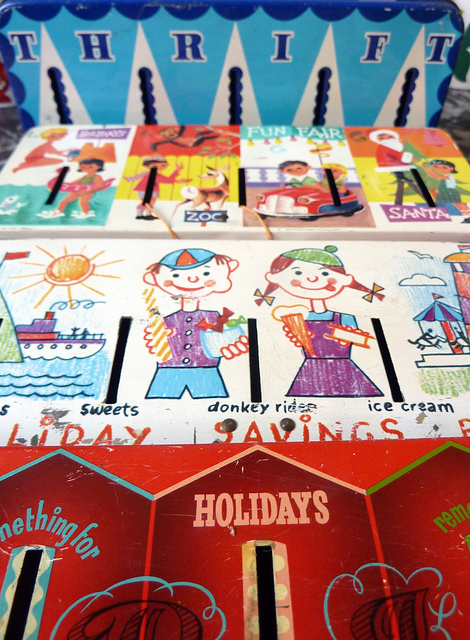 It is an interesting social phenomena that over the decades savings tins morphed from essential savings to more hedonistic savings for things such as ice cream and holidays. Gosh! Of course it is very easy to buy a new copy nowadays but an old musty one that cost less than a pound (in fact it was in amongst some old magazines) is much better. Pressure is now off now for next years chimes at least! I will perhaps create a post on some of the very smug purchases that I have also made and extra smugly given. I am not a fan of expensive presents at Christmas - bah humbug. This is not in a misery guts way - just in a 'I have more than enough' way (We KNOW Jenny!!). In this way I have been able to buy a veritable herd of goats in far off lands built up over the years - a much better use of my money I think. A handmade card from the children is more the enough - though Dom surprised me greatly with my present this year and I will post about that another time. The instant I saw those money boxes this little song popped into my head! And twopence to send home to my wife-poor wife. And no pence to send home to my wife-poor wife. Hasten to add no idea why! Aww - thank you so much for reminding me of this - it got into my head all over the weekend. For some reason half way through it morphs into Kenneth McKellar (if you go that far back!) - was it the same tune perhaps! Whenever I sing the "I've got 6d" song, I have to follow it with a chorus of "Count your blessings, name them one by one"
Thank you for your Christmas and New Year wishes chez moi...I must admit to being very slothful on the festive greetings front and even less conscientious on the blogging front...keep having these vague, half-formed thoughts about doing a blog post but the pesky things flit away before I can grab them and act on them...I suppose it's a sort of extended holiday....if I don't blog then it's still the holidays...no that doesn't make much sense in the real world but it does in my mind. Soon though (she says with crossed fingers). So anyway Jenny it looks like you had a cracking Christmas which is fab, and I hope January is being kind to you and 2013 is not too vile (for any of us) - but rather yields lots of good stuff in all shapes and sizes and forms. Ah dear wendz - back to school marks back to reality and all things 'normal' - very dismal today and ruddy cold too! I too plan for 'no lusting' in 2013 - here's hoping! Keep walking your dog for distraction purposes! What a fantastic collection of saving tins you have there! 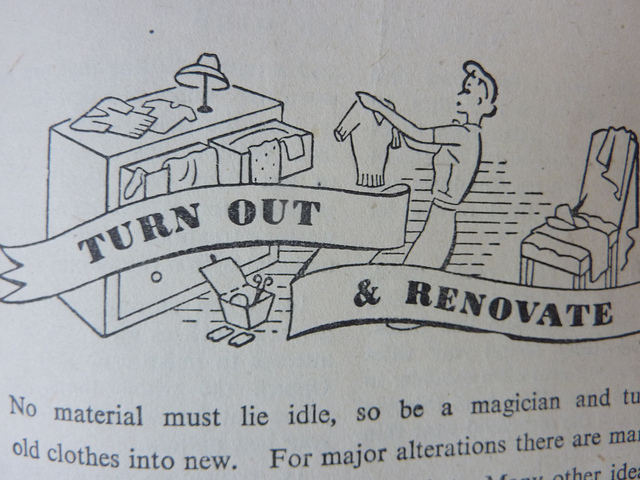 We were always encouraged to save as children, I'm still good at it now, although my love of fabric, wallpaper, and now yarn, gets in the way! Ah - yes I had forgotten about my TSB book - I have it written in my diary how proud I was that I had taken 50 pence to school to save!! I will have to dig that out now!! 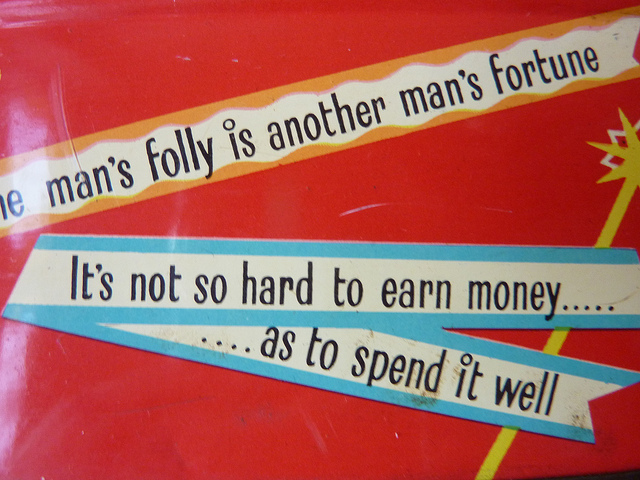 Ooh, I have savings tin envy! What a fabulous collection. I've clearly failed as a mother ... both my girls requested expensive perfumes at Christmas ... so not something to be found secondhand on eBay! Mmmm- that is a bit of problem as perfume does go off after about 30 years I think! Ive led a sheltered life as I've never seen a savings tin like those before! We had tins but they were usually old empty ones and my mum used the electric/gas meters as savings pots...always pputting in more than was needed so when the gas/electric man came to empty it she ALWAYS had a nice little sum left. My brother and I do a similar thing with our pressies - but he definitely won one year, when he gave me a really good amplifier for my hi-fi (dates me I know...) - he'd found it at a car boot sale and repaired it for me. If we can't find something amazing, we go for the seriously tacky instead. Thank you for calling in - I was trying to find the follow do dah on your blog - could you possibly point me in the right direction please? Hello Jenny, now we're in dangerous territory if you're asking me techy questions - but I think if you scroll down - quite a long way possibly - the widgety bit is at the very bottom - tricky isn't it, I'm not sure if I can do anything about that - but I think there should be a follow button there. So pleased you wanted to! Ah yes - multiples of three or more are good! We absolutely love your savings tins collection. So jolly and so reminiscent of a time when every penny had to be accounted for and treats were saved for rather than being an everyday occurrence. We have an old tin savings box here in Budapest in the form of a dog in a kennel. One places the money on the dog's tongue and it is hastily [almost too hastily as one can easily lose a finger]consumed into the bowels of the tin!!!! Clearly, your children are following in your own thrifty footsteps. What a perfect role model you are. Wishing you all a joyously thrifty New Year!!!! Not a phrase that you will hear too often but could I see your kennel box please! Lovely to have you back in town so to speak - keep warm on those icy steppes (a little out geographically)! 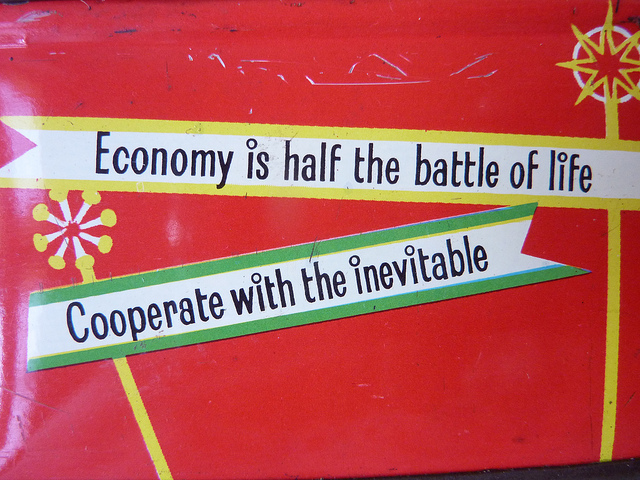 "Cooperate with the inevitable" what a mission statement for life that is!! So glad that you are back in town Ms Jones - and Foxy too! I've never seen one of those saving tins before, but I love the idea! Before I married, I used to divide my cash money like that on payday, to pay my bills. I could have used one of those tins! Yours are very cute. I must look on eBay! 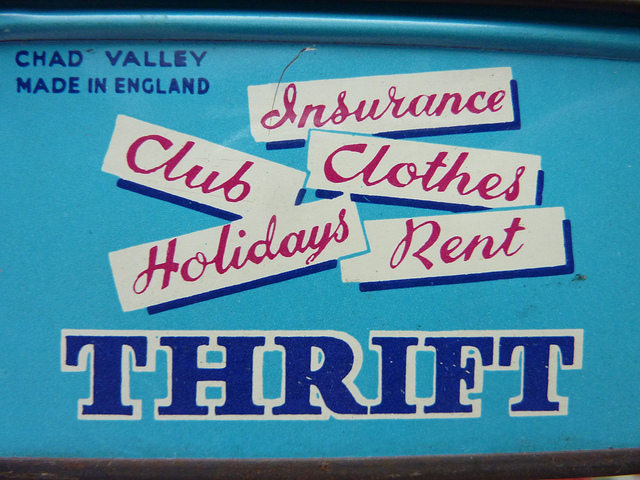 Great collection of savings tins and new to me. Adorable graphics that would make saving all the more fun. New to your blog and enjoying it immensely! Hi Jenny I have never seen tins of that gorgeousness in all my rummagings! I am quite certain that you have a secret shed at the bottom of your garden where you craftily make these things and PRETEND that you have been given them from an old jumble sale!! !Your post does make me chuckle!So anxious to read your latest blog that the tea hubby made has gone quite cold.Can't wait to see under your bed, in the nicest possible way! !Warm regards Pam. Ah dear Pam - one day I will offer you a special invite to an 'under the bed ' viewing! Crikey! Funny, entertaining post, as always, Jenny! Love the tins, but I've yet to come across any on my treasure hunts. I am smiling ear to ear....I have never seen boxes like this! 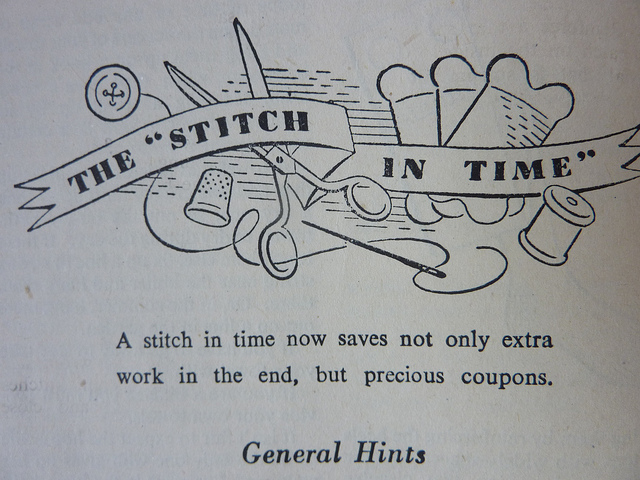 You have such a magical way of weaving the tale...but you are correct, our "vintage" will be around time and time again! Over time it will just become a different vintage - 2010s for example! Those savings tins are wonderful. 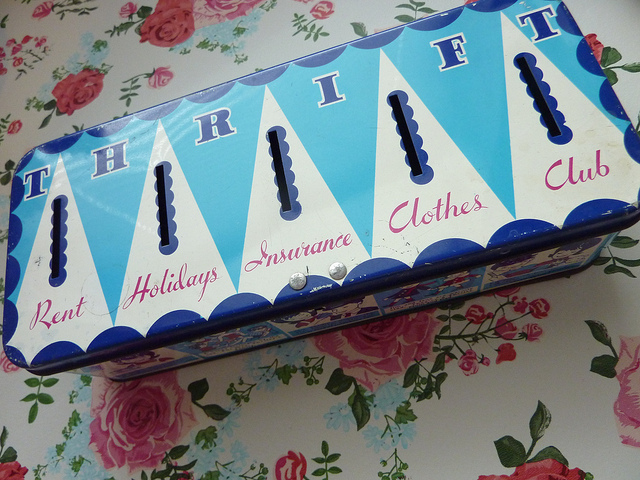 I love the way your thrifty ways have been installed in your children too. My children are the same andasked for the second hand versions on their Christmas lists too. Many thanks Sarah - it is tough sometimes as some children seem to have sooooo much and endless supply of clothes and new shoes but I stick to my guns all the same. Bronte now only wants second hand and nothing else will do! Keep warm in that chilly sea breeze! Oooh Jenny I feel rather old now.. as I had a thrift tin when I was first married in the 70s..It was the only way we knew how to mannage our bills..we were very young bless.. Yes it is good to be thrifty and it is amazing what one can find for very little..
Keep warm indeed - it is a chilly one today! Love your tins. Wish I had one to start the year well. It's was so cute what your children wrote. It is never to young to learn that money does not grow on trees. Hello and thank Rosezeeta - I have tried to leave a comment on your own blog but cannot locate the publish button - Blogger may be having an off day today! What sweet little money tins. Of course the categories have changed from "needs" to a "wants". There is a big difference, isn't there? When I was a kid we often made Christmas gifts for each other, and I still have some of the lovely things that my mom and sisters sewed for me. Today I like giving gifts that help people. One year I gave my best friend a "day of cleaning". Her son was coming home from for Christmas and she needed to get his old room ready for him. Over the years it had been turned into a junk storage room. It took 5 hours, but we got that room cleared out, aired out, washed down, new linens on the bed, etc... I can't remember how many bags of junk and trash we hauled out of there. Thank you GardenofDaisies - I LOVE the idea of giving time as a gift - that really is a super, duper idea and I will hang on to that for next year if you don't mind. By sheer coincidence I offered to weed my neighbours front garden the other day but he had asked his granddaughter to do it instead. Lovely little tins,how different things have become. Hubby and I don't do Christmas gifts to each other, thinking we get things we like all year long. I love the tins Jenny but strangely I cant ever remember my mum using anything like that for saving.I remember us having a big cupboard, similar to yours in our old house when I was growing up and she kept bits of money in teapots and jugs.I suppose a similar sort of thing anyway.At least you knew where you were with cash, all this debit card stuff can leave you not knowing where your money is going. Ah - yes indeed Anne - that debit card does not seem like real money and is a dangerous bit of plastic. Bring back vanilla envelopes for all financial transactions! Dear Mrs. Custard, I have to tell you my husband has traveled to England nearly every month for the last twenty years, and I never knew there were such lovely things as tins and baskets and dishes to be found there. 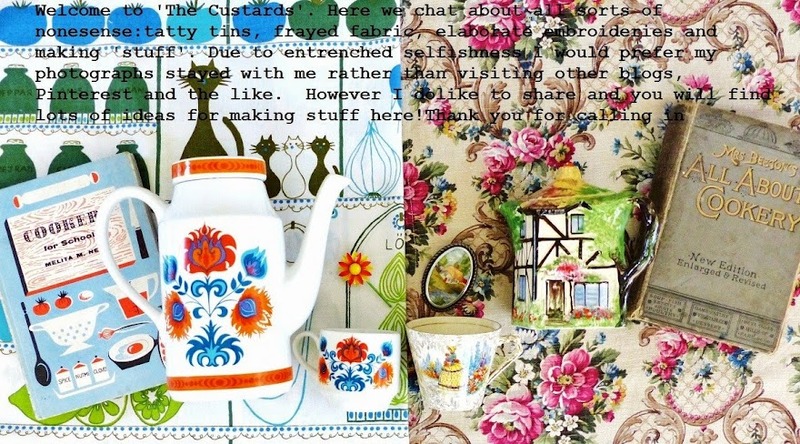 Postcards and tea towels have been about it. But now that I have put before him your lovely blog, I am expecting a basket or tin from his next trip! 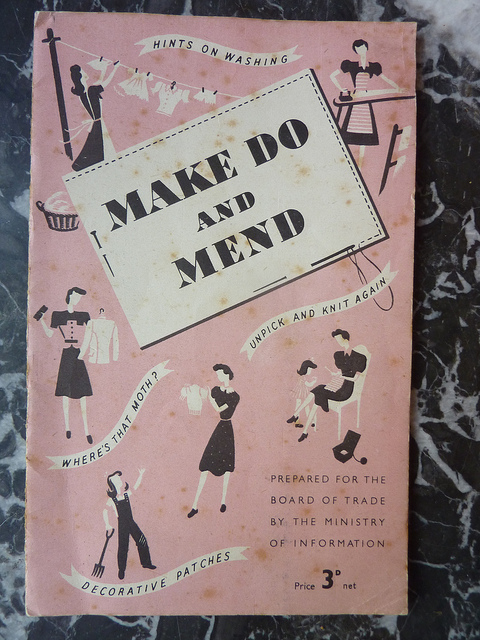 Dear Knittynutter - since reading this I notice a plentiful supply on Ebay! Hi! I just discovered your lovely blog and I'm so pleased I did what a fun read. 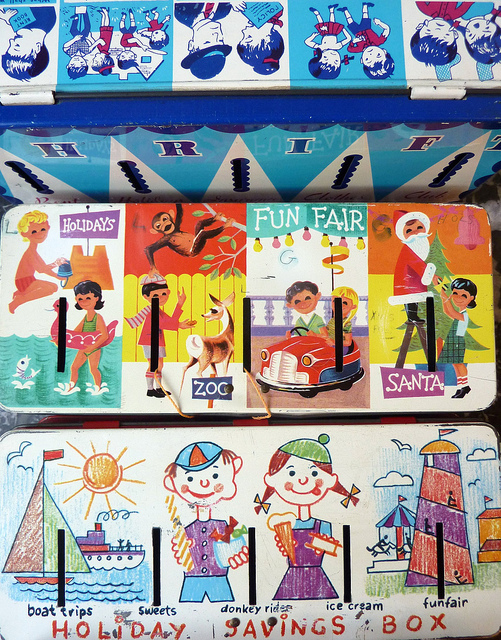 I'm a big fan of anything vintage and just love those heavenly tins! Welcome to your good self - be careful vintage can get out of hand! Beautiful. I am very jealous now as I have a boring green savings tin. Maybe I should jazz it up a bit!